Samsung Galaxy SIII is the well known flagship device and the new flagship device from Phone manufacturing giant Samsung. Samsung has already partnered with different service providers and now Galaxy SIII is available with At&T, Verizon, T-Mobile etc. AT&T Galaxy SIII is available in vibrant colors with Dual core 1.5GHz processor and 2GB RAM to handle Android 4.1 Jelly bean firmware. Right now, I am here to discuss some of the feature rich ROMs for Galaxy SIII that can change your experience. 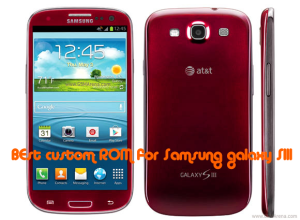 There are loads of Android 4.1 Jelly Bean based custom ROM available for AT&T Galaxy SIII I747 that build with different base and user interface. We have tested some of the ROM and selected some of the ROM that have got good public reviews. Warning: Installing a custom ROM needs root access to your phone, and as you know the rooting voids warranty, please keep these in mind and then proceed. Further, you should not blame us for any consequences you face. I don’t think AT&T Samsung Galaxy S3 will be getting official Android 5.1 Lollipop update. So many developers are trying to get the Lollipop custom firmware work on Galaxy S3. Right now the best Android Lollipop ROM you can try is official packman ROM. But let me warn you that it’s still in beta stage so you may face minor glitches. Users are reporting that most of the things are working and core system is stable. Check out the Android 5.1 Lollipop ROM for AT&T Galaxy S3. SlimKat Android 4.4.4 ROM for AT&T Galaxy S3: I am sure you must be searching for a fast and ripped version of Android 4.4.4 Kit Kat firmware for your Galaxy S3. Xda dev forum senior member nichlovell23 has introduced SlimKat ROM. The ROM is fully ripped and comes in a small package, everything is working stably and there are no bugs. It’s a feature packed ROM for S3 users – like Slimpie controls, keyboard control, Theming options, Control center. There are also some camera features advancements like Smart capture and Trueview. Update: The 7th version of SlimKat ROM is out and its stable and super optimized now. StockMod Touchwiz 4.3 Galaxy S5 experience ROM for AT&T Galaxy S3: AT&T S3 users must be looking for a custom ROM that can bring them the experience of the new Galaxy S5 user interface and features. This ROM has all core features of TouchWiz 4.3 Working on Galaxy S3 with some minor bugs. The ROM is based on AT&T UCUEMJB Android 4.3 Jelly Bean ROM. Aroma installer will help you customize the features while installing the ROM. It already has xPosed framework installer, root permissions and Galaxy S5 theme with some Note 3 features. The developer has added some extra tweaks like Quad View Multiwindow and can view 4 apps at once. Android 4.4 Kit Kat BeanStalk ROM for AT&T Galaxy S3: A XDA forum recognized developer has launched an Android 4.4 CyanongenMod 11 based firmware for Samsung Galaxy S3 LTE version. There are lots of functions and tweak inbuild. Most of the features are working stably and you can use this ROM on a daily basis. There are a few minor bugs and developer will solve them very soon. There will be few more Android 4.4 Kit Kat based ROM available very soon on XDA forum, we are waiting eagerly for a Omni ROM. Bean Stalk Jelly Bean Android 4.3 ROM for AT&T SGS3: Deliberate a senior member of XDA forum has cooked a CyanogenMod Android 4.3 Jelly Bean based custom ROM for LTE version of Samsung Galaxy S3. The ROM is fully working with all features stable. There are numerous optimization done to CM firmware and thus there are lots of detailed control setups and performance tweak. This ROM is light on battery and resources so you can expect a fluid experience. Try any of the ROM’s mentioned above or you can try all one-by-one. Keep in mind you should create a Nandroid backup of your existing ROM so that you can reverse it if anything goes wrong. We are here for your help, so feel free to ask anything you have with you.